Here at The Ice Cream Dream Tricycle Hire we pride ourselves on giving our customers that something special. That’s why we love bringing our wonderful, unique ice cream bicycle service to your event. Our classic Pashley 1940’s styled ice cream tricycles will add something truly unique to your special day. Not just bicycles or even tricycles, they are environmentally friendly and truly vintage vehicles. From them we provide your guests with delicious, award-winning dairy ice cream, lovingly made in Wales. For those guests who don’t eat dairy we have mouth-watering real fruit sorbets to offer, so nobody needs to feel left out. One of the nicest things about our ice cream tricycles is that we can personalise them to match your wedding colour theme. Beautifully decorating the bikes with ribbons and bows, flowers, balloons, traditional bunting, or fairy lights. Just look at our gallery of gorgeously themed ice cream tricycle events to see the stylish way our traditional bicycles fit into any celebration or occasion. Our serving attendants will attend your celebration dressed in vintage clothing to create just the right ambience and we promise you’ll find that their friendly and professional service is a real highlight of your function or party. And of course nobody wants to miss out on a photo opportunity that an ice cream tricycle provides, creating a fantastic backdrop they are encourmous fun for young and old alike, a great talking point keeping your guests entertained. Everybody wants their special occasion to be just that – special. We guarantee that we will help make your event memorable, delicious and unforgettable. Every celebration deserves an ice cream tricycle and whatever your event we can add that something special!! We can cater for all events, you name it, we can do it. The Ice Cream Dream would love to help you celebrate your special day. Our personalised service and dedicated team will ensure that it is a day to remember, an unforgettable experience, leaving you with memories to treasure forever. Our 1940’s ice cream tricycles will provide you with a powerful marketing tool. We can assist you for any corporate event including promotions, advertising, brand/product awareness, team building, fun days and many more. 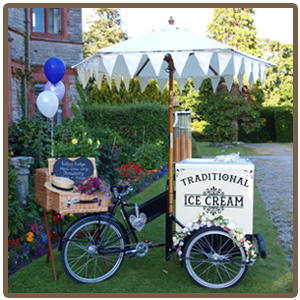 If you are looking for a great party idea and an exciting day to remember, what better way to celebrate your special occasion than with a classic Pashley 1940’s decorated ice cream tricycle filled with delicious luxury Welsh dairy ice cream.